Not only is it the first day of spring in Australia but the first of September is also Wattle Day. Wouldn't you agree that wattle is the perfect flower to welcome spring with it's flowers that look like sunshine. I have to admit I hadn't heard of Wattle Day until I read Rebecca from Needle and Spindle blog post about a beautiful Wattle Day Cardigan she designed and named after the day. It turns out Wattle Day is a day to wear a sprig of wattle, greet each other with "Happy Wattle Day" and organise a picnic, lunch or BBQ with friends or family. I'm going to celebrate by meeting a lovely friend and going to not just one but two quilt shows! 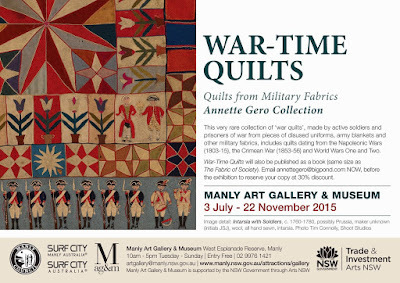 ... there's a second quilt show at the same gallery. Evolution Change Challenge, a contempory show organised by the NSW Quilt Guild. It's showing until the 8th September. 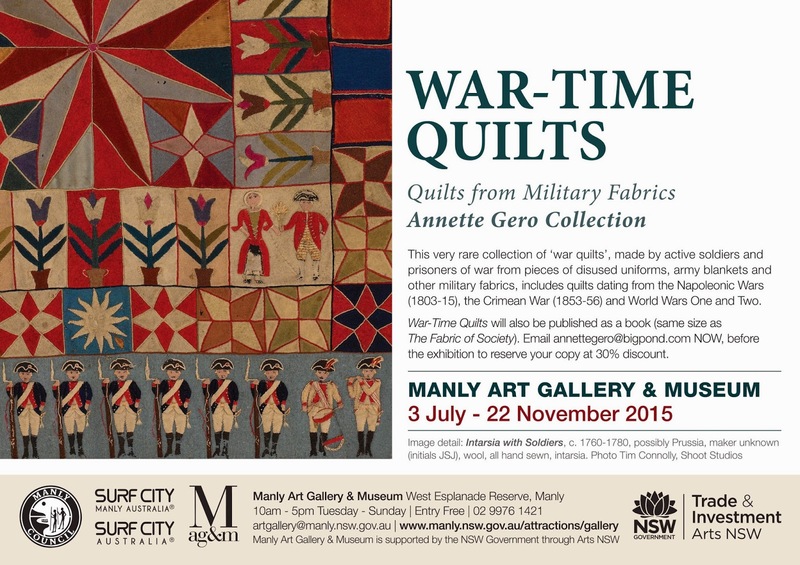 For any quilters thinking of a visit to Sydney to see these shows don't forget there's also the War Time Quilts exhibition with quilts dating back to the 1800's. I haven't made it to see this show yet but it's next on the cards. 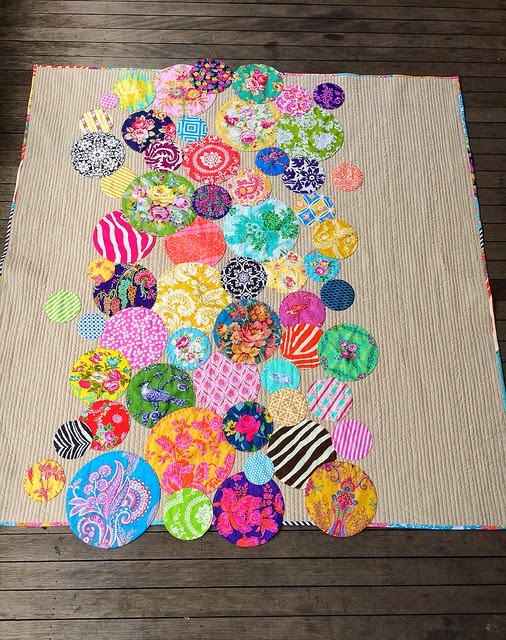 To follow continue with the Australian theme I've been enjoying the wonderful blog posts that Carrie Nelson of Moda's Cutting Table blog has been doing about Aussie Quilters. They have had interviews with Australian quilters Jen Kingwell and Quilt Jane and a post I was particularly impressed by was one with an impressive and comprehensive guide to all the great books by Aussie Quilters. If your book shelf has some space on it it's a great post to check out. A huge Thank You to Moda for highlighting all the great patchwork and quilting going on down under. One more link to share... the one to the original post about my Bubbles Quilt. Thank you for all the wonderful congratulations about my Bubbles quilt being on the cover of Simply Moderne. I've learnt a lot from this quilt and it's unexpected journey. It was one of my experimental ideas that didn't quite work and became something else instead. A fairy tale story of an ugly duckling that turned into a swan. I haven't shown much of the quilt because it was all in a blog post I did about a year ago, but for those who are interested here is the original post. Sew pretty sticheries on some of the circles. Vintage fabrics, using a vintage sheet as the background. Solid colours, or shot cottons, yum!! The possibilities are endless, that's the beauty of quilts and all things creative. I'm off to to catch a train, I have places to be and quilt shows to see. Happy Wattle Day to one and all!! 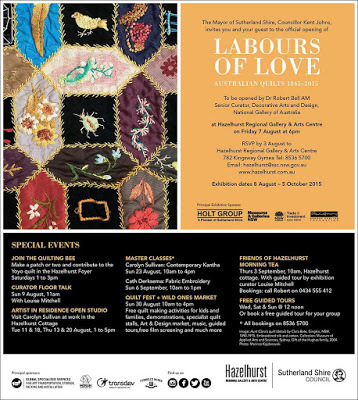 Added 2nd Sept- We couldn't take photos of the exhibition but here is a short film of the curator talking about the quilts. That photo of the wattle is amazing! So much happy yellow texture-a great way to celebrate Spring's arrival. As is your plan for quilt shows, exhibits, etc. Your day sounds like the absolute best way to celebrate Spring - TWO quilt shows shared with a friend!!! Enjoy! Happy Wattle Day to you too! Looks like the perfect time to be in Australia. What great looking shows you have! Such a busy happy post!! Enjoy your spring day!! What beautiful sunshiny flowers to celebrate the beginning of spring. The Quilter's from down under continue to make an impact in the quilting scene. You included. Happy Wattle Day! wonderful blog and beautiful quilts!!! It sounds like you are going to have the perfect spring day. Enjoy yourselves and I hope you see lots of wattle along the way. The wattle at our old house should be in full bloom now. A lovely treat for the new owners to experience. Happy Wattle Day! Well if anyone was going to embrace wattle day, it would have to be floral lover Rachaeldaisy. 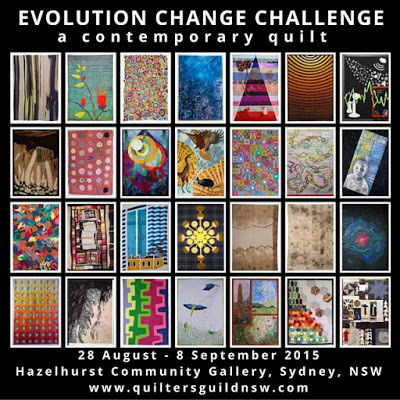 And yay for the Australian quilters doing it their way! Enjoy your exhibitions. What a gorgeous yellow the Wattle is. Never heard of Wattle Day, but Happy Wattle Day to you Rachael. Hope you enjoy meeting up with your friends and seeing those two Quilt Shows. Thanks for all the info in your post - I will follow up the blog posts you recommended whilst I eat my lunch. Your Spring is beginning as our summer ( very disappointing weather-wise) is ending. I am just amazed at how fast the year is galloping by - September already! 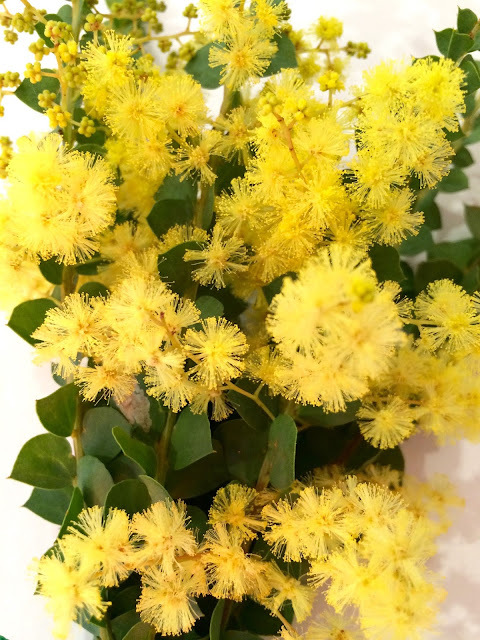 The wattle flowers are so pretty and do look like little bits of sunshine! I have never seen them. I am a big list maker and write one every morning. I like to think it keeps me on task....well sometimes! Have fun at all those shows! What lovely, sunshiney flowers - love them! Happy Wattle Day, Rachel! I adore your bubble quilt, and am so happy for you. Enjoy your shows!! I love the colour of those Wattles.......I do wish they had a better sounding name! Their proper name of Acacia Pycantha is better. I had fun going thru the Moda site and seeing your quilts. BUT the best was that little short film! Of course with Pachobel's Cannon in D it was guaranteed to make me CRY! Gosh, I go away for a month and you end up on the front of another magazine. How exciting!! I am not sure now if I congratulated you on the one at the end of July also. 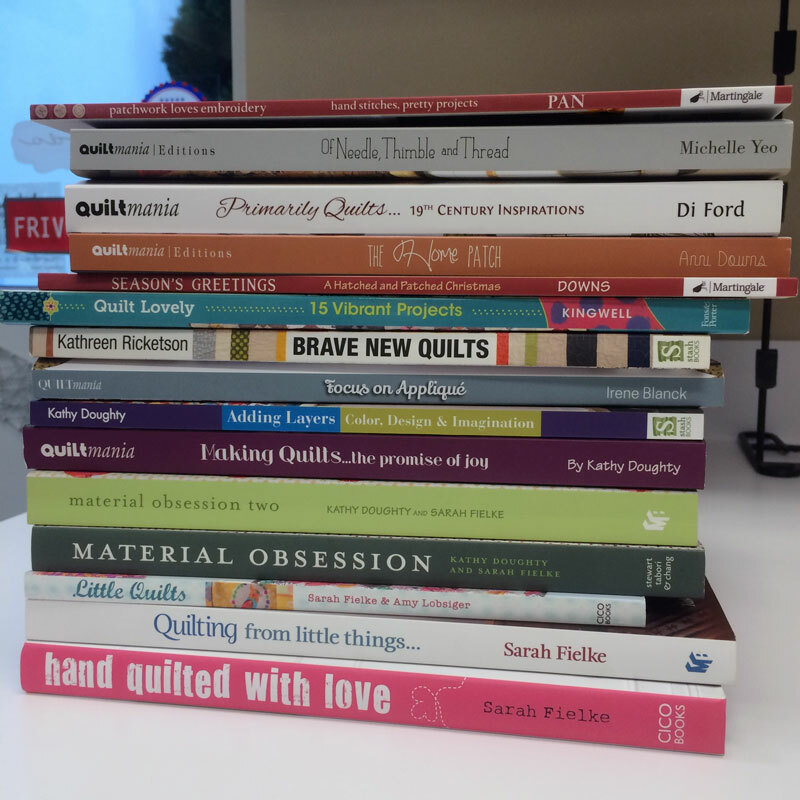 It is wonderful to see all the exciting things that have happened this year with your quilts. And well deserved, too. Hope the exhibitions you plans to see are enjoyable. Have a great week. nice pic of a "wattle". I don't know, what plant it is? We havn't something like that. Thank you for your comment to my work. I'm always happy about each comment. Thanks for posting the wonderful video. What a lovely exhibit of beauties. your bubble photo is so charming! Happy Belated Wattle Day LOL! I hope you had a wonderful time at the quilt shows -- thanks for posting the great little video! I owe you a long email but you've been on my mind this last weekend, mainly because a friend and I have been talking about what to do with a large pile of inherited doilies she has. I showed her your wed and white doily quilt, and the bubbles quilt, and then my brain exploded with ideas about doilies as the bubbles. I just hope my friend likes my idea. PS Found Simply Moderne at the newsie. It's tres superbe! Congratulations again! 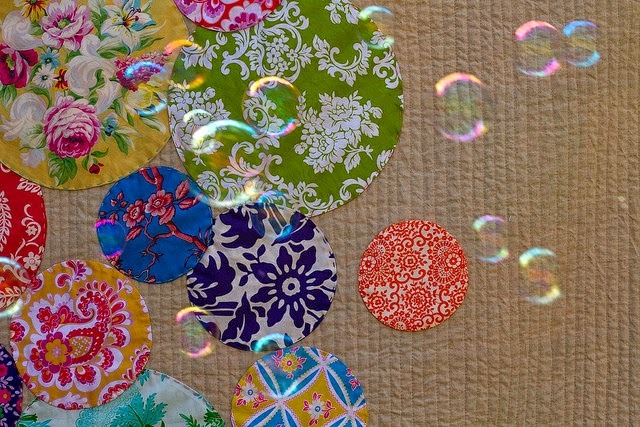 Oh I like the idea of an eye spy bubbles quilt! Or yo-yos!